We’re not ashamed to say that the slow cooker is our best friend in the kitchen, but we typically only use it for dinnertime meals. 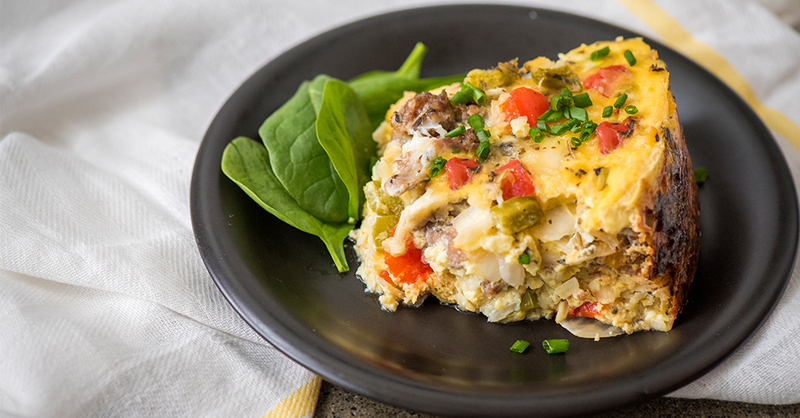 Well that’s about to change with this amazingly delicious breakfast casserole! Packed with morning staples like hash browns, eggs, sausage, and cheese, our whole family loves this dish on the weekend (especially if somehow there are leftovers to start Monday morning with), and we love being able to prep it the night before…waking up to the smell of breakfast and knowing our work is already done is pretty much the best way to start the weekend! Lightly grease your slow cooker with non-stick spray. Spread half of hash browns out on the bottom of slow cooker and top with half of browned sausage, onion and peppers. Sprinkle 1/2 cup mozzarella cheese and 1/2 cup cheddar cheese on top of the veggies, then repeat with another layer of potatoes, sausage, onions and peppers. Evenly sprinkle remaining cheese over everything. Whisk eggs and milk together in a large bowl, then add in Italian seasoning, garlic powder, salt and pepper. Pour mixture over everything in the slow cooker, then cover and cook on high for 4-5 hours, or low for 8-9 hours.